My friend Tammy Silvers from Tamarinis is introducing a new line from Island Batik – just like I will do later this spring! How exciting is this? 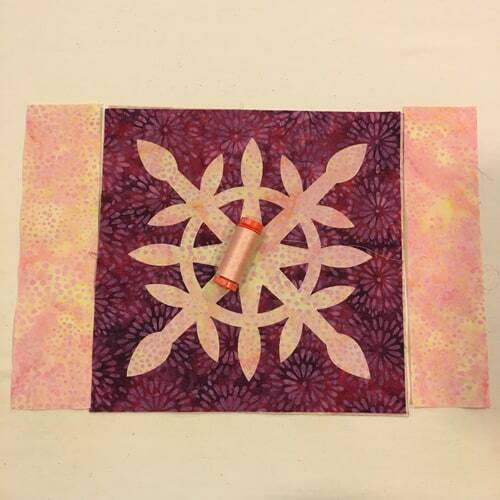 I was thrilled to be asked to make a project using this fabric, as I had a new die from Sizzix that I’d been wanting to try. 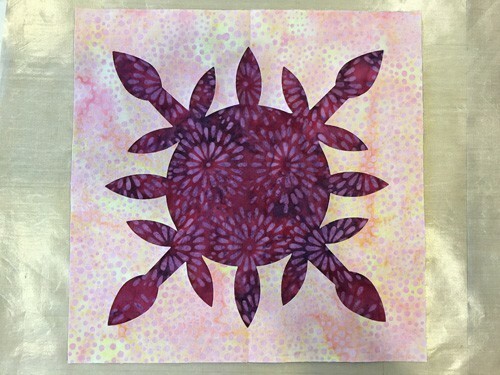 Tammy runs circles around me in pattern writing; she has an amazing array of patterns available – more than 70! – while I think I’m still on my first dozen. 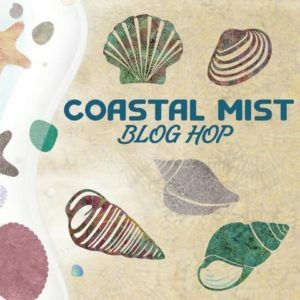 She does really incredible work and I invite you to visit her website and have a look around! In 2015, Sizzix introduced a new die cutting machine, the Big Shot Plus with a 9″ wide bed. Now, whenever they do die releases, they always include a few new dies formatted especially for the Big Shot Plus. 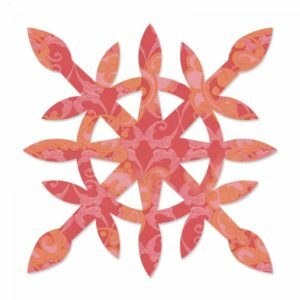 I especially wanted to try the Flower Wheel shape, because it’s a symmetrical applique that’s large enough (right around 8″) to be cut without folding it into quarters, as you have to do with a lot of these types of shapes. 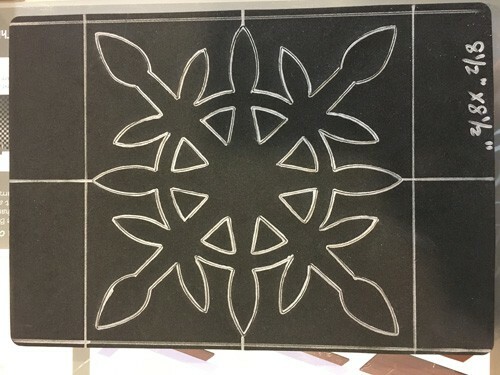 I also like to minimize waste, so I wanted to try using both the negative and positive cuts in my finished project. I came up with the idea for making two small pillows using fabric from Tammy’s line. 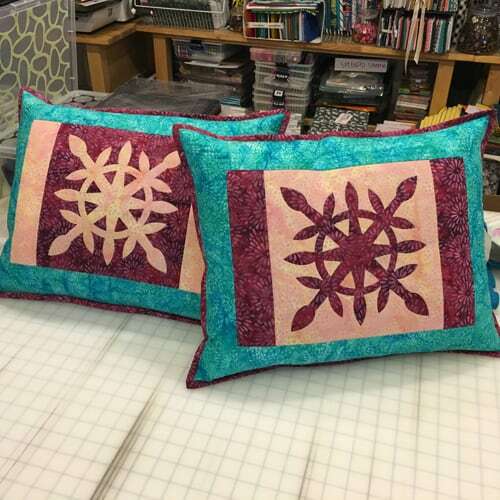 By using the positive and negative cuts, I only needed one die cut shape to make two pillows! 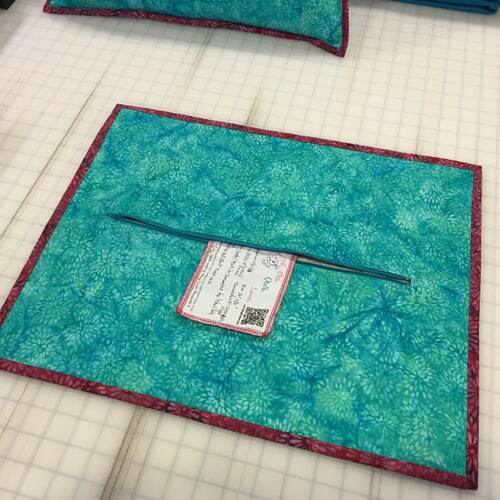 If you use an 8-1/2″ square to cover the shape, you won’t have enough room left on the negative cut for a seam allowance. So I used a 10″ square instead. To center the shape on the square, I pressed the center points on each side of the square, after fusing double-sided web to the back. 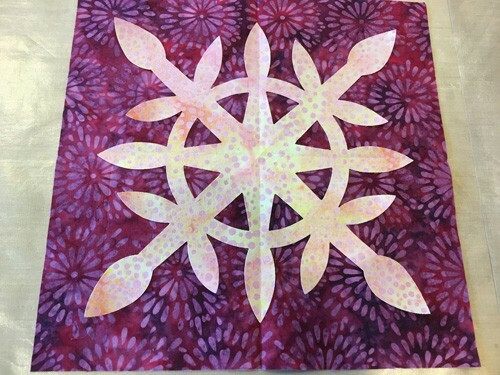 I also took a 6″ square of freezer paper and cut that out as well – you’ll see why in a minute! After making the cuts, these are the shapes I have: The positive, negative, and freezer paper template. You need those tiny little triangles to make the rest of the shape! This is where the freezer paper template comes into play. 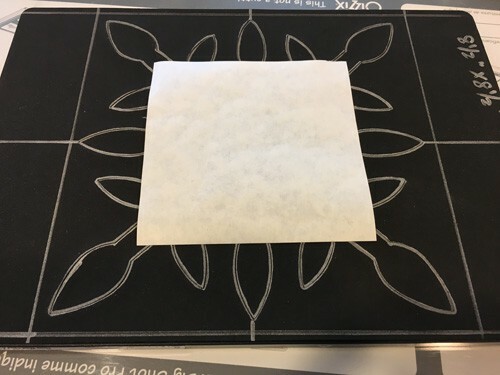 With the wax side down, lightly fuse the freezer paper into place, aligning it with the negative background. Now you can see the holes where the small triangles go. 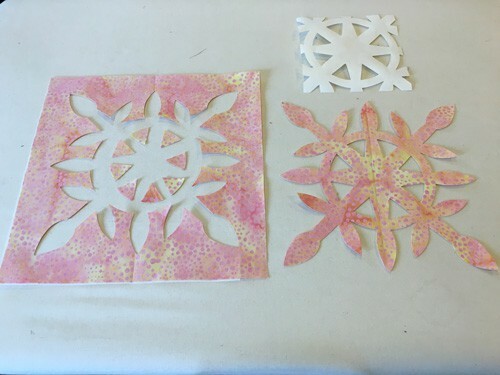 When you do this, try to just lightly tack the center of the small shapes; you don’t want to fuse them down completely yet as you still need to remove the freezer paper. After the freezer paper is removed, then you can fuse them down permanently. 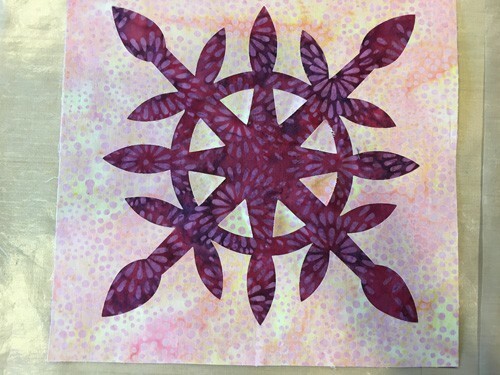 Can you see the complete flower wheel now? From here, I just selected a lovely matching Aurifil thread – ever since I got the complete 50wt collection in the blue suitcase I am able to not just find the right color, but I can use it right away! 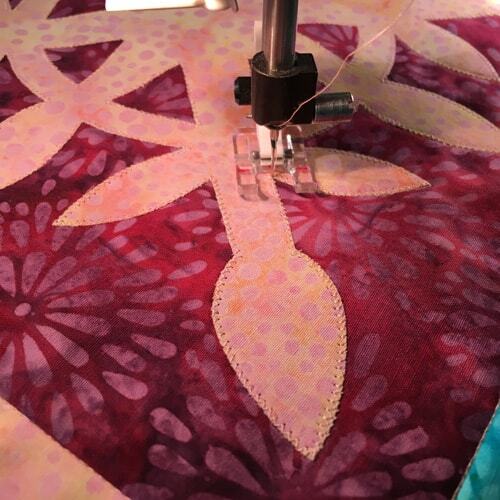 This peachy color is perfect for outlining the applique. Yes, I did go around every little nook and cranny! I used a simple zigzag stitch that is more open and narrow, so I could get in and out of tight turns without needing to change the stitch width. To turn these into pillows, I created a reinforced zipper opening on the backing and stitched the zipper into the opening. 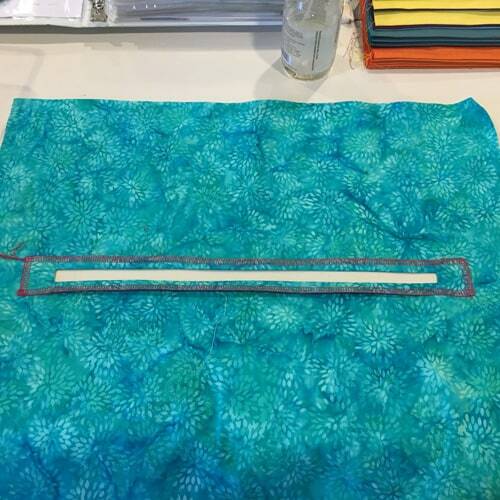 This is a similar method for making zippered pockets in purses, and it’s one of my favorite ways of inserting a zipper. With the backing done, I layered it with the pillow top as if it were a quilt, and then bound it around the outside edge with contrasting fabric. I added a label too, stitched to the inside of the zipper. I’m getting better at labeling my projects! And that’s how I made my two pillows! They currently reside on my living room couch, but I suspect they will find new homes at the studio I’m opening in a couple of months. I’ll tell you more about that soon! Aaaaannnnnd…. there’s a big ole giveaway happening, so be sure to register to win! Beautiful pillows Ebony! Thanks for the great tip on using the freezer paper too! Love the pillows! The positive/negative is a very effective design element! Wow. I love the colors you chose, and the pattern. It looks like a snowflake to me! 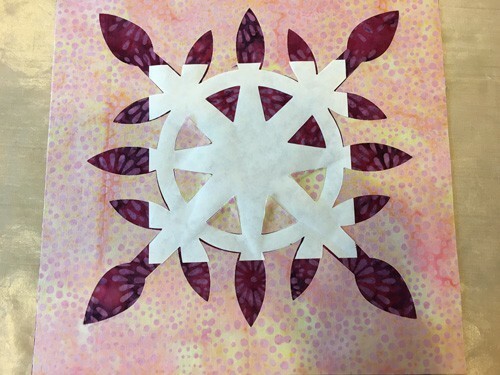 It reminds me of the Hawaiian-style appliqué that I’ve taught myself lately, with the added fun of quick cutting and fusible! I love Island Batiks and I can see Tammy’s line is gorgeous. Thanks for showing your pillows! You have such a pretty blog page…. Store hours: We don't have any. This is an online-only store.